Farzana Mohd. Ameen Shaikh, 16 years, resides in 60 Feet Road, Dharavi. There are 6 members in her family where her father works as a watchman and mother does tailoring at home. Farzana felt that she cannot do self -defence course because it’s a boys training and very difficult for girls. 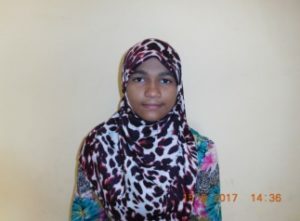 In her words, Farzana says, “ Meera madam informed us about the importance of this course in present scenario and the locality like Dharavi, and that the course was totally free for community girls. The main agenda or goal of this course is to make girls or women learn how to take care of herself and not depend on anybody for her safety. After all this I joined the course, at beginning it was difficult to learn but gradually it became easy and comfortable and now I can teach a little bit to other girls also. On 12th January 2017, I got an opportunity to perform on stage in front of all VIPs from WE Foundations and our parents, it was very proud moment for me and other girls also. My confidence is more powerful now that I can save myself along with my family and others who are in difficult situation.